Breast implants have undergone a large number of revisions since their first release in the 1970s. 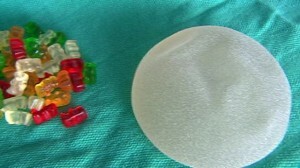 The two currently available implants are saline implants and silicone implants. The implants used for breast reconstruction after a mastectomy are the same implants used for breast augmentation. There are various pluses and minuses for both the saline and silicone implants. The saline implants tend to feel more firm and have a higher likelihood of rippling and wrinkling. The silicone implants appear and feel more natural than the saline implants with less chance of noticeable rippling. After conducting multiple studies on the safety of silicone implants, the FDA concluded that there is no association between silicone implants and various diseases such as lupus or other autoimmune disorders. The silicone implants were recently released on the market again. Although both implants are equally safe and approved by the FDA, some may still be concerned about the leakage or rupture of the silicone implants. If a saline implant leaks, the body will simply absorb the saline. If a silicone implant leaks, the silicone actually does not spread throughout the breast and, in fact, is extremely difficult to detect. For this reason, the current recommendation is to undergo a MRI every other year to examine the silicone implant. Regardless, the outside shell of both the saline and silicone implants is made from silicone. The manufacturer’s warranty on breast implants is 10 years but that does not mean one must exchange the implants every 10 years. If the implant is intact and there are no issues with the implant, continued observation is possible. The risk of rupture or leakage of a saline implant is slightly higher than for a silicone implant initially but this risk becomes equal at approximately 10 years. “Gummy bear,” or form-stable, are the next generation of implants. Recently a newer generation of implants has been released which have been called the “gummy bear implant” due to their texture. The actual name for these newer implants is form-stable, cohesive-gel implants which are made from a different form of silicone. These implants are specifically designed to counteract the effects of scar tissue or capsular contracture which is more prevalent in the setting of radiation. Breast implants are the most common form of breast reconstruction performed worldwide. One can achieve an excellent reconstructive result with either saline or silicone implants.